If We Cloned Early Humans, Should We Put Them in a Zoo or a School? Should Physiology Decide Who Goes In A Zoo? Sahelanthropus tchadensis is, right now, our earliest known ancestral candidate. If anyone on this list belongs in a zoo, S. tchadensis does. It lived about 7 million years ago, in what is now Chad. So far, we’ve only got cranial fossils, but we have enough of them to be pretty confident that these hominins had brains slightly smaller than those of a chimpanzee. It had a chimp’s prominent brows and muzzle. In fact, the only thing that distinguishes this specimen from a chimp is flattish canines (chimps’ canines sharpen themselves by rubbing against their lower teeth) and a very important hole in its skull. The foramen magnum—the hole in the skull where the spinal cord exits the brain—is pushed forward towards the front of the skull. A head-spine connection like that would force an animal walking on all fours to hold its head uncomfortably, but the position is perfect for a bipedal animal. Ardipithecus ramidus lived only 4.5 million years ago, had a smaller brain than a chimp or a bonobo, and probably both climbed trees and walked upright. And then there’s Ardipithecus kadabba, which lived 5.5 million years ago, had suspiciously big canines (although they were roughly shaped like those of a human), definitely walked upright, but also had a brain smaller than a chimp’s brain. Does brain trump foot or foot trump brain? If we go with the size of the brain, these hominins may be less intelligent than chimpanzees. If chimps belong in a zoo, then these should be in there as well. Considering they lived millions of years ago, it might not be safe to put them anywhere but a controlled facility like a zoo. They couldn’t out-think chimpanzees, and given the size of their teeth, they might not be able to take a chimp in a fight. If foot trumps brain, they might not go to a zoo, but they might have to go to some kind of containment facility. If the foot, not the brain, is the gateway to humanity, these hominins might be a dangerous invasive species. The problem with determining where to put these early specimens is the fact that we only have their physical forms to help us judge. That doesn’t tell us enough. For years scientists looked at how chimps and gorillas got around—on all fours—and determined that they were more closely related to each other than they are to us. As it turns out, chimps are more closely related to humans than they are to gorillas. Physiology, and locomotion, don’t tell us as much as we thought they did. You don’t have to walk like a human to be like one. Which Path Did Australopithecus Take? Lucy, a nickname given to the skeleton of Australopithecus afarensis, is our most famous ancestral candidate. There are a group of australopithecines—Afarensis, Amaneses, Sediba, Garhi—who lived about 3.5 million years ago and left their bones spread out across eastern Africa. Some experts are convinced that these are the earliest version of us to be found. In the 1960s, bones of A. africanus were found near the broken bones and horns of animals. Raymond Dart, a well-known anthropologist and anatomist, believed this was evidence that the australopithecines were making tools, and even called Africanus, “Australopithecus Prometheus.” Today, some researchers point to modification of the internal structure of A. afarensis hand bone as evidence that the australopithecines were using their hands to make tools the way neanderthals used their hands to make tools. And then there’s Homo rudolfensis. H. rudolfensis lived in Africa just under two million years ago. It had the teeth of an australopithecus but a jaw that looked more like a modern human. 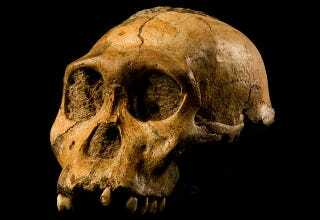 It also had a brain so big that its remains were first thought to be Homo habilis. Now some scientists think that it might be a kind of Australopithecus—one with a big brain. If we consider this the path of the Australopithecines, it would be unconscionable to put them in a zoo, or even a contained space. Although Lucy, for example, had a brain roughly one third the size of modern human brains, that may be only because she was proportionally smaller than modern humans. (Homo floresiensis, for example, had a brain roughly a third the size of modern humans’ brains and definitely did use tools. It may, according to a few scientists, be a modern human with a growth disorder.) It likely wouldn’t be humane to keep Australopithecines in schools or modern homes, but they were intelligent, tool-making human ancestors, very different from chimps. Perhaps the best way to deal with them is to put them on an island and monitor their progress. We probably want them contained, but we want to give them (early) human dignity. That’s not the only way Lucy’s story could go. Many scientists taking a look at the broken bones and horns near the bones of Australopithecines have concluded that the surrounding bones were shattered by animal predators, not early tool-makers. The Australopithecine bones were there for the same reason the animal bones were there—they were prey. And then there’s Orrorin tugenensis. Orrorin tugenensis lived 6 million years ago. It had the thick enamel and built-up femurs of a human, and it does not appear to be related to Australopithecines. In the eyes of many scientists, this is our actual ancestor. The Australopithecines were a widespread but ultimately doomed little evolutionary stub. They didn’t make tools and they probably weren’t intelligent. Their only claim to humanity is managing to walk upright on two feet. Back to the zoo with them. A Minder or a Teacher? At one point our early ancestors didn’t get much credit. In the early 2000s, there were theories that a defective gene rendered Neanderthals speechless, that burial sites with flowers and other ceremonial objects were coincidences because Homo erectus couldn’t have a complex thought, and that 200,000 years ago, modern humans came roaring out of Africa and killed every other species in their way without interbreeding with them. Homo erectus almost certainly marked up shells, though whether out of artistic vision, a desire to mark property, or pure boredom is anyone’s guess. Homo heidelbergensis built shelters, controlled fires, and hunted with spears. And Homo neanderthalensis definitely interbred with modern humans. As did Denisovans. With these groups, the question isn’t whether or not they should be in a park or a zoo, but whether they should be in a care facility or a school. The decision hinges on how much we know about them. In this contest, Homo erectus comes out looking less fit. Though there is some evidence that Homo erectus was able to control fire, and make some kind of art, the evidence is sparse for a species that had covered a continent for nearly two million years. While it probably couldn’t hurt to put H. erectus in some kind of learning program, it probably wouldn’t be ethical to leave them to their own devices in a modern society. Homo erectus wouldn’t be safe in the wild (and modern hunters and hikers probably wouldn’t be safe around Homo erectus in the wild, either), wouldn’t be containable, and probably wouldn’t make it in society alone without care. The ancient people we know most about, thanks to their relatively recent “disappearance” and their generous donation of genes to all non-African people, is Homo neanderthalensis. Could you march a Neanderthal child into kindergarten and expect typical results? That is one hell of a debate. For one thing, there’s a lot more Neanderthal DNA floating around the modern world than some people think. Though no one person has a lot of the DNA, the bits and pieces people do have could add up to as much as 40% of the Neanderthal genome. These pieces make it sound like Neanderthals and modern humans are one and the same. Actually, for many scientists it’s evidence that we really are different species with different abilities. And one of those abilities is again in dispute. Again, it’s the Neanderthals ability to speak that’s in question. While they did have a gene that allowed them to speak, it might not have been regulated the way it is in humans. And this gene may help people shift from a pure problem-solving mode into a more unfocused associative mental mode. This might allow them incorporate seemingly-unrelated aspects of their experience, when dealing with a problem, and then switch back to problem-solving mode again to iron out the details. A Neanderthal child in a human school may be lost and confused, unable to keep up. On the other hand, we have evidence that H. neanderthalensis, as a species, was sailing the seas before humans were. We’ve got evidence that they used bone tools. Some scientists think that any belief that the Neanderthals lagged behind humans, mentally, is simply a human superiority complex. A recent review, more satisfied with ambiguity than most, states, “It can neither be proven nor excluded that they were our cognitive equals, but they were close enough to us, biologically and cognitively, to interbreed successfully and leave a genetic legacy in our DNA.” In light of the ambiguity, H. neanderthalensis probably should be integrated into schools, into society, and into everyday life as much as possible. If we were to pick any ancestor—that we know a lot about—to try to “mainstream,” these would be the people.